SPA studio artist Georgia Landau works on a sculpture. Find out what a toad house looks like. Discover how encaustic artwork (wax painting) got its start. Why are there so many different paint brushes? 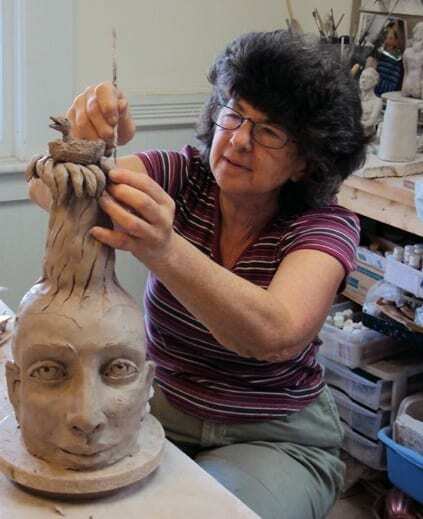 Studio artists at Studio Place Arts (SPA) in Barre welcome visits throughout the year and they will be opening their doors along with other area artists on May 24 and 25 for the statewide Open Studio Weekend. Visit with more than 10 studio artists at SPA over the weekend. (There will be a schedule of activities posted at the front door of SPA and at the SPA website.) Watch Maggie Neale spread sumptuous colors on fabric and then scoot across the hallway to see how Georgia Landau sculpts clay figures. Upstairs, check out a stained glass studio. Open Studio Weekend at SPA will also include: (1) the opportunity to view three major art exhibits, including “It’s Black & White” (main fl gallery), “The Art Game” by the Hecht Family (2nd fl gallery), and “Tangents: Fiber Diversified” (3rd floor gallery); (2) seconds sales in several studios; (3) demonstrations in front of the SPA art center and in the studios; and (4) information on several of the new public sculptures and the artists behind these sculptures in the classroom. On Saturday, May 24, SPA will be open from 10am to 5pm and on Sunday, May 25, SPA will be open from noon to 4pm. While you are in Barre, be sure to visit three artists working at the Mathewson School building located at 65 Elm Street, just a few steps away from SPA. Artists around the state will be participating in Open Studio Weekend. Look for bright yellow signs placed along Vermont’s roads to guide you to other open studios, visit vermontcrafts.com for maps and directions, or pick up a free Open Studio guide at any Vermont Welcome Center or participating gallery.